mark your calendars & come out to a food-themed alley cat bike race saturday april 11th!!! food skillz, not speed, required. registration for the race begins at 2pm at Duncan Plaza in the CBD (bring 10 bux for registration donation), race starts at 3. checkpoints will have food-themed challenges and you can earn extra points by scavenging edible items along the way & couriering them to the finish line for our veggie & crawfish boil AFTER PARTY at Handsome Willy’s with DJ Dieout, party starts around 5-6pm or so. did i mention there will be PRIZES?? …like coffee beans from Hey! Cafe, cassette tapes from Domino Sound, a tattoo from Sailor’s Cross, swag from NOBS, Tribe Bikes & State Bikes, gift certificates from Maypop Herb Shop, St. Coffee, Shake Sugary, Lost Love Lounge, Gerkin’s Bike Shop, Juan’s Flying Burrito, Theo’s Pizza, Half Moon Grill, and more. oh, and a HUGE thanks to ben passmore for the sick flyer & NOLA Alleycat for the endless support. that’s what you get for losing the 2nd place prizes, drew! big picnic outside of city hall! 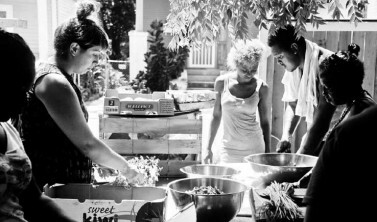 this is what community kitchen does every tuesday at 3pm rain or shine. its free and its for all to enjoy. every week we serve beans and rice and whatever else is donated to us that day! sometimes we have to get creative. our van broke down so now we stuff ourselves and all the food and plates and tables into a car…not the best option! we need $$$ to fix our van! Trystereo’s 2nd Birthday Benefit Show at the Big Top featuring local bands: Mea Culpa, Low Brows, Precious Metals, and dance tunes spun by DJ Lady Li. Come for part of the show or all of the bonanza! Sliding scale, no one turned away. last night’s benefit dinner was a great success! thank you to all the unbelievably dedicated volunteer who cooked, served, & scrubbed dishes. we pulled it off and the rain stayed away! if you are free today & want to help clean, come by! also holler at us if you want to be involved in future events. kitchen at commiekitsch dot org. xoxo! after a SIX MONTH hiatus… the next commie kitsch benefit dinner will be July 11th. keep posted for a flyer on your nearest refrigerator…. flyers go out & rsvp will commence on january 17.
the months keep rollin’ by and we continue to grow and be so super awesome. december 13th was the first ever community kitchen speakeasy supper party secret cafe pop down restaurant: the commie kitsch. and it was a complete spectacular success! we surpassed breaking even and can now buy some more supplies and continue to support ourselves in 2013.
another community kitchen benefit show! with Mea Culpa, Lechuguillas (ATX) and Curved Dog!